Gov. Jerry Brown talks to Dolores Huerta at the UFW Conference held at the Rabobank Theater and Convention Center. 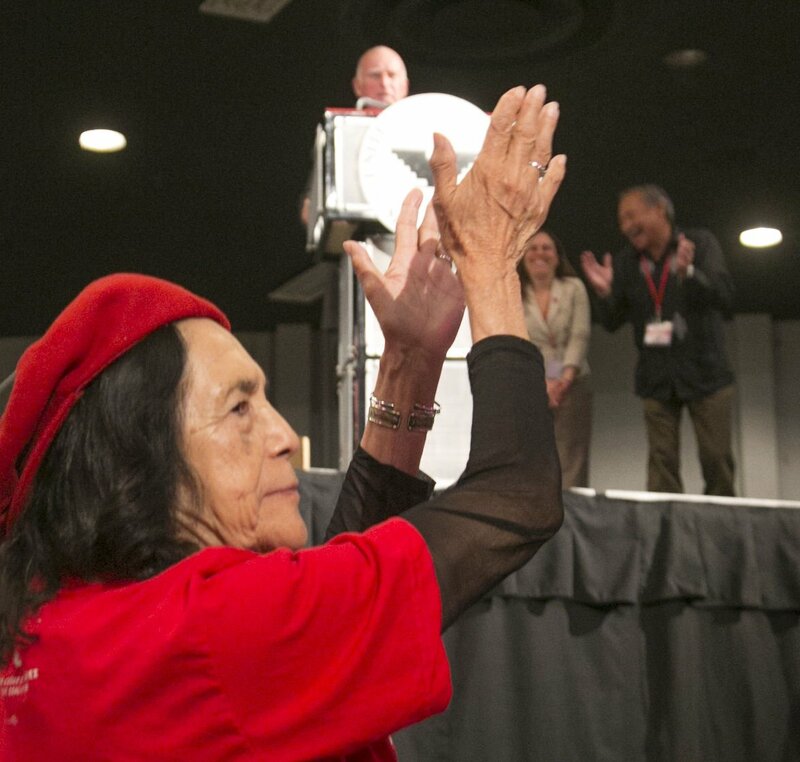 Delores Huerta, along with others attending a UFW Conference held at the Rabobank Theater, gives a hand to Gov. Jerry Brown. Gov. Jerry Brown receives a token symbol from the UFW Conference held at the Rabobank Theater and Convention Center. Delores Huerta along with others attending the UFW Conference held at the Rabobank Theater give Gov. Jerry Brown a standing ovation. The crowd cheers on Gov. Jerry Brown as he speaks at a UFW Conference held at the Rabobank Theater and Convention Center. Gov. Jerry Brown speaks at a UFW Conference held at the Rabobank Theater and Convention Center. The crowd was chanting, “Jerry, Jerry, Jerry ...” but it wasn’t the “Jerry Springer Show,” it was the Jerry Brown Show at the United Farm Workers 20th Constitutional Convention held at the Rabobank Theater in Bakersfield on Saturday. Former President Bill Clinton is slated to speak Sunday, but on this day, Brown had the floor, and he seemed to be enjoying himself as he took pot-shots at Republican leaders in Congress and at the GOP’s presumptive presidential nominee, Donald Trump. They’re “primitive” and “one step above cave men,” he said of congressional Republicans, warning UFW leaders, delegates and rank-and-file workers that the GOP is intent on destroying the rights of workers. The convention, held every four years, gives UFW members the chance to get together to vote on new officers, review progress made and challenges faced, and celebrate decades of the union’s history. In what had to be an example of near-perfect timing for the union, blueberry workers who struck for three days this week in northern Kern County overwhelmingly voted Saturday to be represented by the UFW during a union representation election overseen by the state Agricultural Labor Relations Board. About 100 of the blueberry workers entered the convention in a triumphant procession Saturday. “This is one of the biggest break-throughs for the UFW in Kern County in a long time,” said UFW spokesman Marc Grossman. Indeed, the union in recent years has battled the perception that it is no longer as relevant as it once was. But Grossman noted globalization has changed the face and structure of agriculture, and in response, the union is becoming much more international in its scope. The four-day convention began Thursday with workshops to discuss the UFW’s new international initiatives. Delegates, alternates and family members later boarded buses to visit the home and gravesite of UFW co-founder Cesar Chavez at the National Chavez Center near Keene in the Tehachapi Mountains. Earlier in the day Saturday, California Attorney General and U.S. Senate hopeful Kamala Harris received a warm reception from union leaders and delegates when she praised the union and its leaders for what she said was its historic role in protecting the rights of the least powerful among us. “The work of the United Farm Workers has always been about challenging our country to live up to its ideals, and unfortunately the struggle continues,” she said. She called for reform in the justice system, noting that 80 percent of prison inmates are high school dropouts and children who are truant in elementary school are much more likely to drop out of high school. Harris drew cheers and applause when she told the crowd that she was the first woman of color to be elected district attorney in California. She broke through a similar barrier when she was elected as the state’s “top cop” in 2010. Brown would later echo those concerns. Harris touched on climate change, water policy and the environment. She called for reform in the nation’s approach to immigration, calling it “the civil rights issue of our time.” And she said it was time for politicians to stop defining people searching for a better life for themselves and their families as criminals. “An undocumented immigrant is not a criminal,” Harris said to cheers. Rep. Loretta Sanchez, D-Orange, Harris’ Democratic opponent in the Senate race, was also scheduled to speak at the event Saturday. But Sanchez canceled, said a UFW spokesman.